These is getting embarrassing now. Every time it comes to me writing up the review for the latest episode of Doctor Who it seems to be one of the best episodes of the season. Apart from perhaps Kill The Moon and The Robot of Sherwood every episode of this series that I’ve reviewed has been a contender for the best. The latest episode Flatline is fortunately not an exception and, shockingly, is perhaps the best of the series. The episode certainly didn’t look like it was going to the best of the series from last weeks preview, especially as it seemed like a Doctor-Lite episode which aren’t usually the best (forget the awesome Blink, Love and Monsters anyone?) But the episode got off to a good start with a creepy opening involving a paranoid man being sucked into the walls. The episode only got better from there, with a very funny and very unique ‘mini-TARDIS’ sequence. 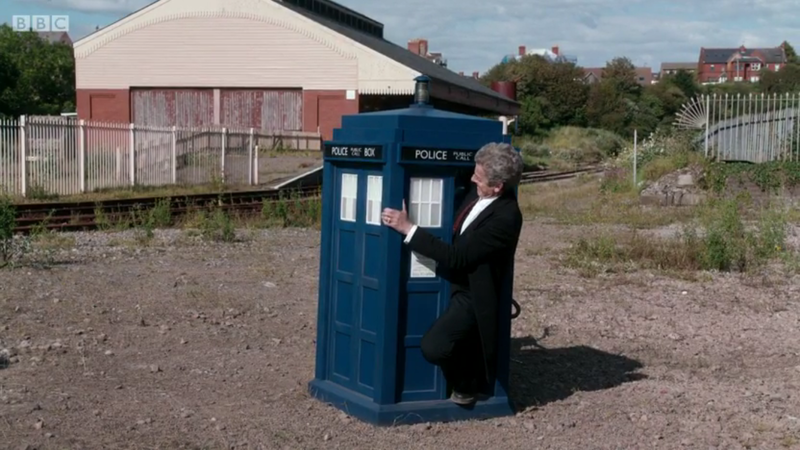 The image of the Doctor and Clara squeezing out of a small TARDIS into a crap Bristol landscape was a hilarious moment that really showed of Capaldi’s comedic chops. The TARDIS continued getting smaller until the Doctor was trapped inside, cementing this as a Doctor-lite episode. But there was no need to be worried, Clara was extremely good this episode, having to be a sort of substitute Doctor for a while. Hopefully the Clara haters who exist out there will have seen a different side to her this episode, although I worry if you didn’t like her already then this episode won’t change your mind. The monsters of the week in this episode were also very strong, starting as a 2D threat that stuck to the walls changing into creepy 3D zombie things that weren’t a far cry from the Taken in the Alan Wake games. Nearly every Doctor Who episode claims to have a monster to scare the kids but the boneless may actually make them cower behind the couch. This wasn’t just down to the creature design either, retuning director Douglas MacKinnon’s brilliant direction helped a lot. I’m not sure the monsters would’ve worked quite as well in bright lighting but the creepy horror movie lighting, especially in the train tunnels made them extra creepy. The side characters were also quite solid in the episode, some more than others. Rigsy could have ended up as being really irritating but luckily he was funny and didn’t spend too long questioning the Doctor and Clara and just got on with the episode. Rigsy’s boss was also good, well in fact he was the opposite; he was awful, but it’s a credit to the actor that he managed to convey that well. He also lived at the end which was a nice change from the clichéd ‘bad guy dies’ rule the show usually adheres to. There were a couple of other characters who weren’t fleshed out quite as well, such as the train driver, but this didn’t detract from the episode at all. The action in the episode and the conflict between the characters all felt new and the episode didn’t hit familiar beats like the show sometimes has the tendency to do. The tiny TARDIS scenes were my favourite scenes though, with the Doctor’s close call with the train a particular highlight. The script was also great in this episode following the high bar set by last weeks. First time script writer of both episodes, Jamie Mathieson, needs to be kept around as his scripts have been some of the best ever and they really bring the best out of the cast. There really isn’t much else to say, the episode was as perfect as you could imagine with every aspect working perfectly. Perhaps Rigsy’s strange suicidal moment felt a little odd but again, none of this detracted from what was probably the best episode of Doctor Who in quite some time. The direction was brilliant in both the murder mystery first half and the more horror driven second half and the script was equally brilliant. The effects were awesome and more importantly, they were creepy. This was an episode that unfortunately doesn’t come around too often. Every single part of the episode worked and it ended up as one of the best of not only this series but New-Who as a whole.